M83 and James Harvey are two creative entities separated by medium alone. 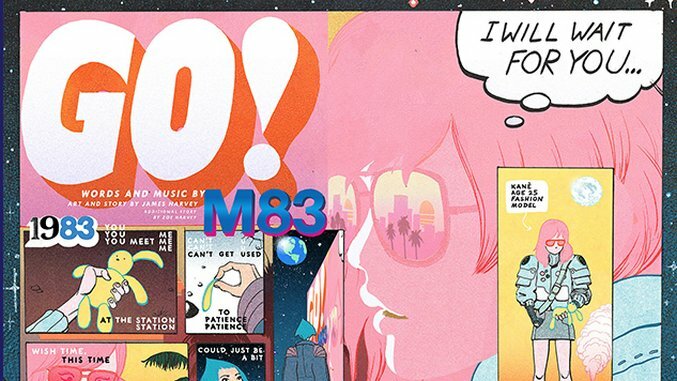 M83 mastermind Anthony Gonzalez layers his tracks in countless layers of vibrant synth, restless bass and airborne guitar, taking his aesthetic cues from the “avant garde” era of ‘80s pop. On his most recent album, Junk, that nostalgic affection bleeds through with string sections and whimsical melodies inspired by yesteryear sitcoms like Who’s the Boss and Punky Brewster. Harvey’s most recent project also channels ‘80s television gold into a startlingly brazen experience. Alongside assistant editor Alex Jaffe, Harvey spearheads Bartkira, a community effort that invites cartoonists all over the world to contribute panels that merge The Simpsons cast and locales into the post-apocalyptic biker dystopia of Katsuhiro Otomo’s Akira. It’s pretty damn great. The project follows illustration work on DC’s We Are Robin and the oversized body-horror Masterplasty. In the latest Songs Illustrated, Harvey applies his neon, ben-day-dot surrealism to the second track and single from Junk, with vocals from Mai Lan. Harvey takes the themes of romance, separation and hope in “Go!” and assembles them into an intoxicating lunar odyssey. Also: epic airborne alien battles. The cartoonist has crafted an intricate work teaming with detail and information, designed to be read while listening to the track above; click on the image and click again (pending browser) to get the full scope of the interstellar journey. M83 is currently on tour.